The definition of Global Health as a field can be traced to the 2009 Lancet article that reflects a consensus reached within a sub-set of CUGH leadership at the time. There was an alternative definition put forth at the same CUGH meeting by a colleague from Kenya. He proposed that the definition of Global Health is a “concept fabricated by developed countries to explain what is regular practice in developing nations.” Though an oversimplification, this perspective emphasizes a real risk in Global Health education and practice — the fabrication of a context outside our own frame of reference. The Consortium of Universities for Global Health (CUGH) is the premiere gathering for academic institutions from the United States who are embracing the field of Global Health. As an academic field, Global Health is striving to better include institutions and colleagues from low and middle income settings, and to foster a burgeoning ‘walk the talk’ movement focused on representing “local” Global Health for health equity in our own backyards. As I return from this year’s annual conference, I am struck by an evolution in the recognition of CFHI’s work and our growing Academic Partnerships. 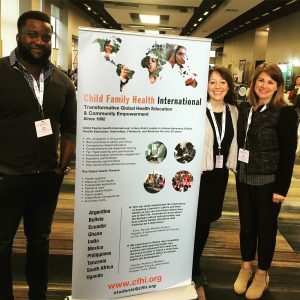 Though we have long been at the forefront of conversations around ethical global health engagement, often helping to define standards in the field, Child Family Health International, (CFHI) as a non-profit “NGO,” has sometimes been perceived by faculty and academic institutions as inferior to colleges and universities. This type of thinking has pervaded universities and has led to derogatory labels such as “ivory towers.” After more than 25 years, alas, I am happy to report an increasing recognition that CFHI’s rigor, evidence-based educational programs, and operationalization of best practices in Global Health education and partnerships deserve the admiration and respect of academia. The conversations I am having are no longer in a spirit of convincing faculty and institutions of CFHI’s legitimacy, but rather constructive discussions about the how and the why of subtle, yet essential, nuances of quality, ethical, and transformative Global Health Education and Experiential Learning. CFHI will continue to lead with research, constructive dialogue, and standard-setting programs. We will do so because this risk of fabrication of complex realities and global health contexts worldwide is a driving force behind our work. Gratefully, CFHI, a collaboration of community and academic-based educators from 10 countries partnering with universities to provide Global Health Education, is receiving well-deserved esteem from academia. CFHI looks forward to continuing to strengthen our partnerships with universities to teach Global Health through mutually respectful collaborations and partnerships. This entry was posted in Academic Partnerships, CFHI Model, Ethics, Global Health on March 20, 2018 by Robin Young.